Your porch is the gateway to your home and the first place your guests see when they visit, and a holiday porch pot can set a festive mood right at your door to welcome visitors with elegant seasonal style. It's easy to use a combination of container gardening guidelines and floral arranging tricks to make a stunning arrangement for a holiday porch pot all your guests will admire. Ideally, you will have two pots for your holiday porch pot – the interior liner to actually make your arrangement, and a more elegant, decorative shell. The liner is critical because when your pot is frozen, it is possible the pot will crack and may not be able to be reused – you don't want that to happen to a more expensive, stylish pot. An inexpensive plastic pot is perfect for the liner, since it will be hidden within the shell. If you live in an area without risk of freezing temperatures, however, you can create your arrangement directly in the larger shell if you prefer. The decorative shell for your pot can be any style you like – a rustic wooden crate or barrel, a Victorian-esque pedestal pot or even a glazed ceramic pot in bright, festive colors. You may choose to leave the shell as-is, or you could paint it with holiday stencils or add other decorative accents that will coordinate with the pot's arrangement. 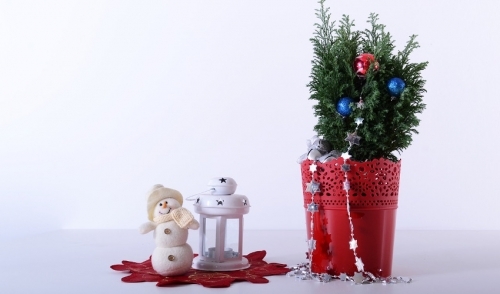 Your holiday porch pot will need a strong base to hold greenery, stems and boughs upright. If your liner pot is already filled with dirt, you can just use that, but be sure the dirt is tamped down well so it will provide a sturdy base for the arrangement. Sand is also a good option for filling a pot to hold a holiday arrangement. Be sure any drainage holes in the bottom of the pot are plugged so the dirt and water (part of the freezing step) will not leak out. A piece of duct tape is perfect for temporarily plugging any holes, and can be removed in spring if you will be reusing the pot. If you are using a liner pot, insert it into the decorative shell before filling so you don't need to lift the heavy pot. You want your pot to be lush and filled with a variety of winter greenery. Opt for cut boughs, twigs and small branches from fir, cedar, pine, juniper, holly and other evergreens, blending different shades of green and different textures into a lush arrangement. Place taller, longer sprigs in the back, and flexible, spiller boughs in the front to cover the lip of the pot. Fill in the center with thicker greenery to be sure there is no dirt visible. In addition to basic greenery, consider adding berry sprigs, curly willow twigs, pine cones or birch branches to the arrangement for additional textural interest and color variation. Whatever you use, be sure the ends of the branches are pushed 4-6 inches into the soil or sand so they are firmly settled and will not wiggle or tip in a chilly breeze or if accidentally bumped. Not sure where to get greenery? You can trim your own from your evergreen landscaping, or visit a local garden center or nursery for seasonal cuttings. Christmas tree lots may have pruned branches available for free or a very low price as well. Once your greenery is arranged, add water to the pot to help solidly freeze the soil or sand and keep the arrangement firmly in place. It is not necessary to fill the pot to the top – doing so will make it more difficult to add extra accents – but add enough water to firmly brace the greenery. If you've inserted the boughs, branches, twigs and sprigs deeply into the pot, you may not need much water, but if your arrangement is shallow, more water will be needed freeze firmly to hold the arrangement. Before you add water, however, be sure your pot is in the location you want it for the holidays. Once filled with water and frozen, even a small pot can be very heavy and difficult to move. You can place the pot on a rolling stand for easy movement, or simply be sure it is in the right position on your porch, deck, stairs or entryway. After watering the pot, allow it to freeze overnight and your arrangement will remain firmly set. Whichever accents you choose, they can be amazing decorations to really add eye-catching flair to your pot, which will stay vibrant, fresh and festive throughout the season to welcome every guest to your home.